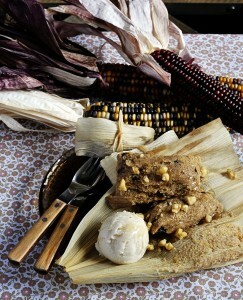 Tamales are super delish but have you ever had a dessert tamale? Tamales Dulces, or sweet tamales, are a fabulous way to end the meal. Top with a scoop of vanilla ice cream and you’ll be transported to the warm shores of Latin America! Gather corn husks, separating those that are broken. Take the intact leaves and soak in warm water for at least 1 hour or until soft and easy to fold. It’s best to put something on top of the husks to weight them down in the water to keep them submerged. Once soft, be sure to rinse any residue before filling. Mix 2 / 3 cup butter in a bowl until creamy. In a medium bowl mix flour, cornmeal, sugar, cinnamon and salt. Alternately, add flour mixture, water and condensed milk to butter, mixing well after each addition. Melt the remaining butter. Gradually, beat the dough mixture to give a consistency of thick cake dough. Add a dash of vanilla extract, raisins and nuts. Spread ¼ cup of batter, using the back of a spoon to form a square sized patty in the middle of the corn husk. Fold the leaves over the batter as though you are wrapping a gift, covering the batter completely. You can use strands of corn husks to tie them shut or twine works fine as well. Repeat with the remaining dough and husks. Place a basket for steaming (like a vegetable steamer) in a pot with lid. Pour water until it just reaches the bottom of the basket. Arrange tamales upright in the basket. Top them with the remaining corn husks and a damp cloth. Cover it with the lid until the water comes to a boil. Decrease the heat and cook on low. To keep steaming, add more water if necessary, and let the tamales simmer for 1 ½ to 2 hours or until the dough begins to loosen the leaves. Remove and plate in the husks. Unwrap and enjoy! These are yummy with a little scoop of vanilla ice cream too! Pour the boiling water and melted margarine into a blender first. Follow with the powdered soy milk, sugar, and vanilla, and blend it all up for 30 seconds. Pour into a glass container and keep covered in your refrigerator until it thickens and cools.